I am in love with thread. I don't think I can have too much. A lot of these threads are "vintage" e.g. wooden spools. These fabrics were found at Woburn's "That Fabric Place." I wish I could afford to shop there regularly - but nothing is cheaper than $10 per yard. But sometimes it's worth it to splurge- I get tired of the selections at Wal Mart and Joann's. I had a hard time letting this little guy go- I was very pleased with the way it came out. Enjoy it Missy! I had a lot of fun making this purse. You can find the tutorial here. I am kicking myself for not looking into doing such a pattern sooner because following someone's directions, rather than trying to wing it on your own, is very easy! I just got ahold of a long beading needle, some seed beeds, and I set to work. It was fun and quite addicting. The process was very easy- you can get a kit to make buttons at any craft store. Here's the inside of the bag, it has a little pocket. This bag definitely took me longer than one hour to make, but it wasn't too time consuming. The fabric I used is from Uganda- one of the many pieces I bought while there last summer. If I had to do the whole thing over again I probably would have made the bag deeper and chose a lining that matched the outer fabric better. But overall, I am quite happy with it! I made this little guy for my mom. It's got the coloring of the Cheshire cat, don't you think? His legs look like they have muscles.... but I have to say that getting the stuffing to stay smooth is not an easy task. 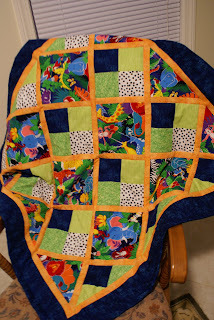 Here's a baby quilt I made for Ian, the son of my BYU freshman roommate, Melinda. I found the pattern in the 2008 Fons and Porter EasyQuilts Spring magazine. Congratulations Melinda! 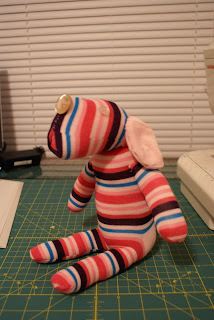 Nick helped me make this sock dog for his mom for her birthday. 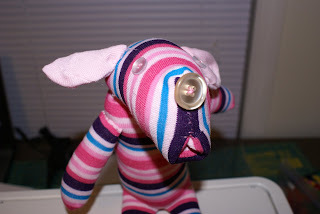 He stuffed, I sewed. I was pretty pleased with the way it came out. Finally! A cute pattern that is boy-oriented. I had to get a bunch of this cute astronaut-flanel from Joann's a couple weeks ago. 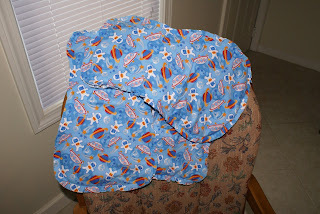 I made burp rags for one of my visiting teachee's who just had a baby boy. Last night I did something I rarely do: I actually bought a book at a store instead of getting it at the library or a yard sale. Of course, I had a 40% off coupon, so it was pretty reasonably priced. 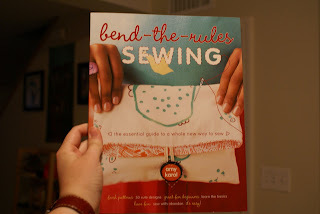 I am really excited about this book- it's quite popular on all of the crafty websites/blogs out there. Hopefully I will be able to use it soon and learn how to make some new things. So- I was going to write a post about how some people shouldn't be parents (inspired by my work in counseling children and families). But I don't want to think about work right now. Instead, I want to implore all of you out there to take advantage of the rebate offers at CVS, Walgreens, and Rite-Aid. All of these things you see pictured are products I got for free (within the past 2-3 months) by doing the drugstore rebate programs. I don't think I have ever spent money on toothpaste, tampons, shampoo, or hair stylers because the stores constantly give them to me for free! Each store does it a little differently, but the concept is the same: you buy the product, send in the receipt, and later receive a refund check. In some cases, instead of getting a check, you get a coupon of "extra bucks" that you can use like cash on your next purchase. I have been busy with a lot of crafts lately that I plan to post this week. 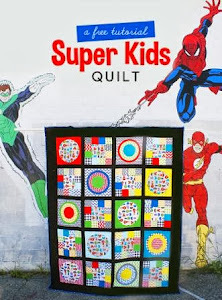 I attended a quilt show at my former middle school this weekend and really enjoyed myself. 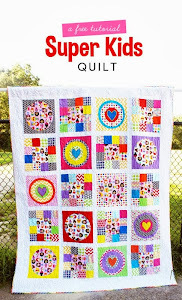 I talked to a sewing machine vendor who assisted me in falling in love with a $2,500 Pfaff Grandquilter...... I can dream, right?